Unfortunately I’m not growing a veggie garden this summer, but I do have some wonderful strawberries from last season’s plantings (from Farmer Dave). What a difference compared to my older strawberry plants. The worms still attack the leaves, but the plants are strong enough to fight them to still be healthy. 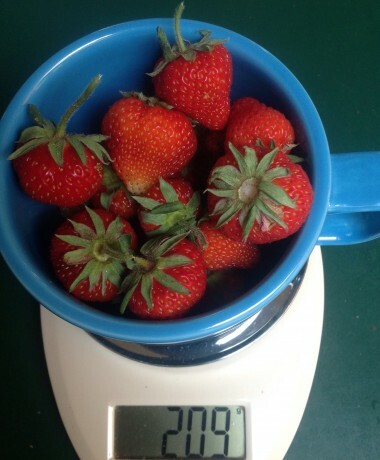 In just two days, I’ve netted almost 1/2 pound of strawberries. Please know, I’m not a tea expert or connoisseur by any means. When I tried it years ago, I’m sure I brewed it incorrectly, using too high temp water or brewing for too long; I didn’t like the taste at all. But in my opinion, this green tea is yum. 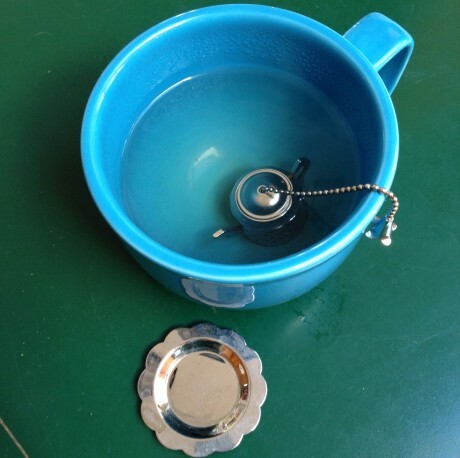 Taste (when brewed properly – 175-180° for 4-5 minutes) is light but full of flavor. Delicious! Aroma is exquisite. Plus, like other good quality loose teas, I can get at least two cups from one scoop serving. BONUS! So, it’s really not as expensive as one might think. And you’re getting a fresher, higher quality product when you brew the leaves yourself. The dry leaves are dark (almost black) and good-sized, but after brewing, they really puff up and turn a healthy green. 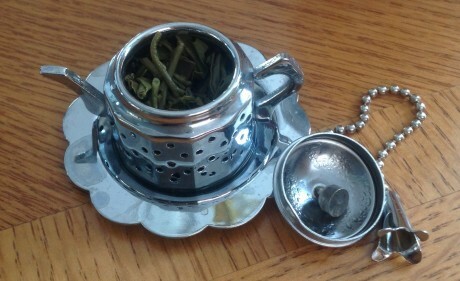 I have a cute little chrome/silver teapot-shaped infuser that I use, and the leaves open fully inside. In fact, they expand so much that it’s difficult to scoop them out after I’m done brewing. I don’t think that happens with the dusty ground tea bits inside most grocery store tea bags. Now that I’ve found loose teas again, I’m looking forward to experimenting. Hmm, how about some gunpowder green tea, and oh yes, wanting to try matcha green powder! Anyway, you can find Peet’s loose tea online or at their retail coffee shops, if you are lucky to live near one. I don’t know if they sell their teas at grocery stores, like their coffee. This month, I’ve decided that I need to work on “me” – loving myself, accepting myself, taking care of myself. And specifically doing something special for myself every once in awhile, that I wouldn’t normally do. I was shopping in Lexington, MA yesterday. 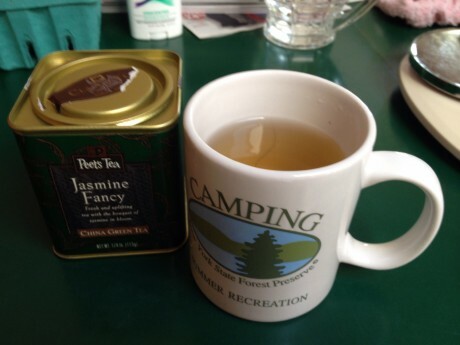 I parked my car about 1/2 mile from the center of town, and walked to Peet’s Coffee & Tea shop, where I picked up a tin of Jasmine Fancy loose-leaf tea. Yes, that is one of the good things I’m doing for myself: Loose-leaf tea. I was hungry, so I decided to treat myself to lunch at Panera Bread. I ordered the tomato mozarella flatbread sandwich. Just a teenie sandwich with a bag of chips next to it, but it was wonderful sitting by myself, feeling independent and relaxed. I rarely ever order good food when I eat out. It’s usually something quick and cheap at a fast food chain. But this month, I’ve started eating clean again…and I have refrained from unhealthy take-out or junk food for a couple of weeks now, and it has paid off BIG time. My energy is up, I’m starting to lose the extra weight I put back on, and even my feet are less dry and cracked. Ha! My new mantra/affirmation: “I love myself unconditionally right now” ~~Louise Hay. I was watching the movie “Hungry For Change” earlier this month, and the part that most struck me was from Dr. Christiane Northrup – speaking about the power of loving yourself. I immediately wrote down the affirmation, and decided to try it. I’m not sure if it’s exactly working, but it must be doing something right, if I took time for lunch at Panera yesterday! Today I stopped by the Lowell Winter Farmers Market (Mill City Grows) at the Mill #5 on Jackson Street. I love this market. It’s on the 4th floor of an old mill building, complete with old creaking wooden floors, high ceilings and an old elevator to take you up. I love walking down the long isle, full of market vendors, as well as cute little artisan “shops” in their own rented storefront spaces. I found a wonderful farm named Maple Shade selling goat meat, something I’ve been thinking of trying, since seeing it at the Salem NH farmers market. It was $10/lb for ground or stew meat. I chose ground for now. It’s supposed to be very lean. I’m excited to try it. I also bought some lovely pork sausage from Foxboro Farm – $10/pkg (approx 1 lb), then sauntered back to the front for veggies and from Mill City Grows, I bought 2 small baggies of greens $4.50 (mixed and pea tendrils) and I spent $8 at Jones Farm for a bunch of carrots, bunch of radishes, brussels sprouts, and some awesome crisp apples. I’m thrilled to learn that they are keeping the market going through the end of June! And I’m also thrilled that so many farmers are keeping local food available in New England all year long! I’m so happy and proud. I “put up” a good amount of jars this season. 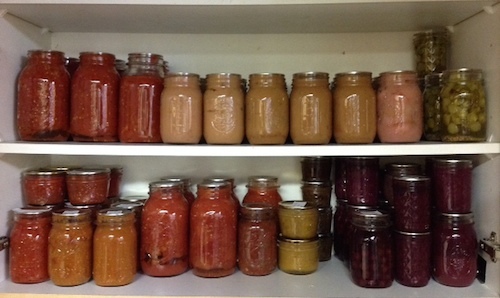 There’s lots of tomatoes (pints & quarts): chopped, roasted, juiced, & slow-cooked, Concord grape jam & juice, peach maple jam, rhubarb chutney, spicy sweet tomato jam, pickled green cherry tomatoes, cortland applesauce, honeycrisp/gala applesauce, tomato jam, and one lone salsa from last year. Plus there was some spring strawberry jam that’s LONG gone because it was so scrumptious. My freezer stash includes blanched green beans, chopped raw green peppers, raw whole jalapenos, chopped raw celery, celery leaves, lots of bone/veggie stock, and a bit of canning leftover chopped tomatoes. We had some leftover honeycrisp applesauce for the fridge, and it was absolutely delicious. Probably the best I’ve had! Yum. I’m still contemplating if I should buy another half bushel to can more applesauce in quarts for all the upcoming holidays (Thanksgiving, Christmas, Easter, Mother’s and Father’s day). I got a decent deal on “seconds” from Mann’s Orchard – $16 for 21+ pounds. Considering, honeycrisp are regularly $2-$4/lb, I was thrilled! I want more! And I’d love to try a batch of sauerkraut. I’ve previously tried fermented pickles, and one batch was great, while the other spoiled. I’ve recently learned that Diamond Kosher salt (my go-to brand) measures completely different than pickling or table salt, so I wonder if that might have been the problem. I’m feeling brave enough to try on a head of cabbage I just bought at the farm. Of course, now that I’m totally addicted to homemade water kefir, I think more fermented foods are in order. Other canning plans? I have been saving many interesting recipes from canning and preserving books (public library I love ya), and I’m hoping I’ll find time to make some sort of hot pepper sauce (fermented perhaps), as well as cranberry relish, beet relish (w/caraway), rosemary onion confit, ginger pear chutney. There are so many wonderful recipes out there, we’ll see what I can do this year. And well, there’s always next year too! Finished planting our veggie garden this weekend. I wasn’t sure if I was going to have one this year, but my DH, God bless his sweet soul, borrowed a rototiller and got the soil ready. He even expanded the width of the garden a little. I’m hoping to get a photo of the garden soon! Wow it’s been so long since I’ve posted. A lot has been going on. First and foremost, I am EMPLOYED! Yay. After being laid off three separate times by the same company, I am happy to report that I have a brand new job that I really love! I’m earning more money, but with that comes more working hours, which translates to less time for other things! Haha! But I’m adjusting. During our financial rough patch, I was humbled when I realized how difficult it is to eat healthily AND responsibly with less spending. I’ve had to cut some corners. I think the biggest adjustment was buying more meat from Whole Foods instead of the local farm. I’m happy that I didn’t have to resort to supermarket factory-farmed meat, but now I can completely understand why so many families are forced to purchase cheap meat because their food budgets are stretched to the max. We are a two-person family and I can’t even imagine how difficult it is for larger families. How dare I criticize anyone for their food choices, especially if they are trying their best on a limited budget!!! It was easy for me to preach home-cooking from scratch when I was unemployed or working less hours. Heck! I was home for the majority of the day for the past 3-4 years. Of course it was simple for me to find time to bake bread, can tomatoes, make lunches, and cook dinner every day! Now that I’m away from home 6.5 – 7 hours a day, I realize how difficult it is to manage and balance my time at home. But I’m making adjustments and utilizing shortcuts like the crockpot, meal planning, and make-ahead freezer dinners. It’s arrogant for me to criticize a working mom choosing canned cream soup or a jar of tomato sauce. Everyone has their own set of restrictions and who am I to judge. It’s another humbling lesson learned. Thursday, I received a meat delivery from Open Meadow Farm – the first one since January, 2013, before I was laid off in March. I am so blessed to have the means again to buy meat from a local farm! I will never take it for granted again! Today, after receiving their newsletter, I decided to register for the Spring Vegetable CSA at Farmer Dave’s. We had a CSA for two summers a few years ago, but this will be a first for the off season. Sure, I’m paying a little more than I’d pay for vegetables at the grocery, but I’ll know exactly where and how my food is grown and it’ll be worth it. And I won’t take THAT for granted either! I feel lucky and so BLESSED that both my husband and I have good jobs. There’s an overwhelming amount of appreciation and gratitude for my life. I’ve been on the other side (unemployment,) and it’s very depressing and degrading. But there are no regrets, because without emotionally dark experiences, I’d never realize how special the lightness is. Hurray, my spending for October was way under budget. Awesome! My total food expense for the year is well under the projected high total of $5000. I even ended up lower than the $4800 that I was hoping for! To read more details, check my post over on my budget blog. I surprised myself and came in under budget this month! To read all the details and more, check the post on my Healthy Budget blog. I’m up for the challenge! October Unprocessed 2013 is right around the corner, and I just took the pledge for my third year. I just need to set some customized ground rules ahead of time; the original Eating Rules processed food definition is a bit too stringent for me, so I’ll be thinking about my own guidelines in the next few days. It’s extra exciting this year, as Bob’s Red Mill (my fave) is sponsoring the challenge and they are offering some really valuable coupons, like REALLY good coupons, for those that sign up. I’ve been slacking on my blog lately, and I’m really hoping this will spark new creativity. I’m looking forward to next month! Author debbie @ That's Just MePosted on September 17, 2013 September 17, 2013 Categories Food, Personal ChallengesTags Bob's Red Mill, FOOD, healthy, October Unprocessed, October Unprocessed 2013, Personal ChallengesLeave a comment on October Unprocessed 2013 with Bob’s Red Mill Coupons!